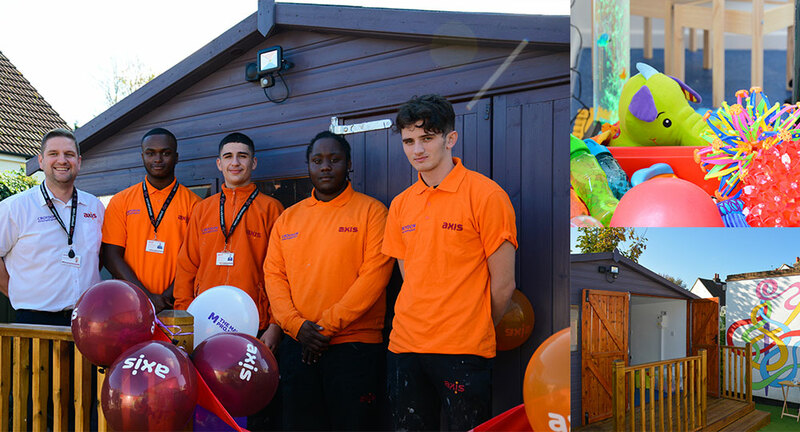 Axis‘ First and Second Year Apprentices created a Sensory Barn for The Maypole Project, a Bromley-based charity which provides a lifeline of support for children with life-threatening illnesses and their families across south east London. Axis Apprentices undertook the project as part of the annual Axis Apprentice Challenge. 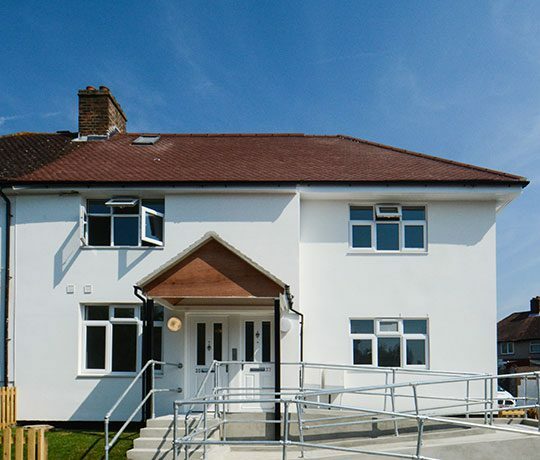 Works included: groundwork and wall render; installation of a water feature; painting a mural; building a ramp; laying artificial grass; providing and installing a new door, flooring and internal cladding as well as general painting and decorating and associated electrics. To the decking area the Apprentices applied anti-slip paint and also put up the trellis and boarding to the balcony, before finally fitting the special sensory equipment in the cabin. The Sensory Barn was built during summer 2018 and was completed ready for opening and use on 16 October when Sally Flatteau Taylor, Founder and CE of The Maypole Project, and Ian Rhodes, Divisional Manager at Axis, cut the ribbon. Leading supply chain solutions provider Travis Perkins Managed Services donated all the materials for the works and TW Drainage built the ramp and prepared the ground to accommodate the new electrical connection to the cabin. Axis believes in supporting small, local and impactful organisations with a long term hand up rather than a handout. The relationship between Maypole and Axis dates back to 2016 when the Axis Foundation donated a minibus to The Maypole Project. The minibus helps over 500 children a year, transporting them to different events and activities. 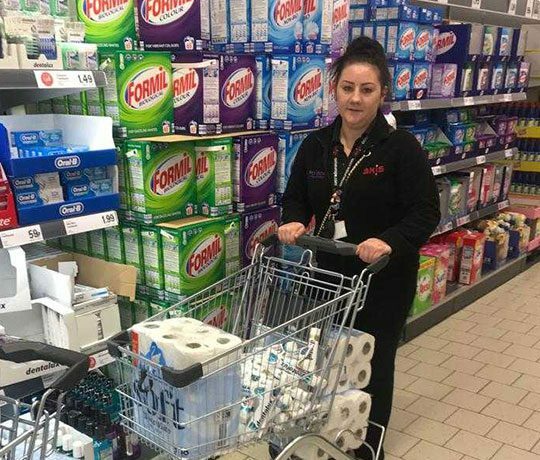 Axis also donated a stairlift improving accessibility within the Maypole building. The Sensory Barn is the latest donation by Axis to the Maypole Project which works with families in Bromley, Lewisham, Greenwich, Lambeth and Southwark and supports the whole family from the moment of diagnosis, creating a package of care tailored to the needs of the parent/carer, siblings, extended family and ill child themselves. Travis Perkins Managed Services has, as a valued supply chain partner, a long businesses relationship with Axis Europe PLC. 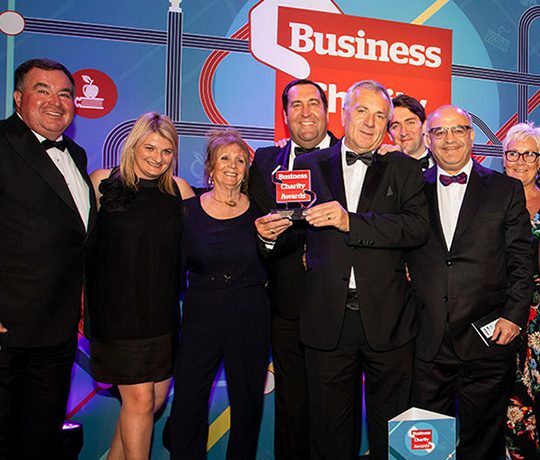 Both Axis and TPMS place their Corporate Social Responsibilities in the heart of their businesses and have a high regard for local communities and traditional family values. In its 20-year history, Axis has consistently trained apprentices, launching its formal Structured Apprentice Scheme in 2003. Apprentices now make up 10% of the workforce. Axis Apprenticeships are increasingly-prized placements – in 2017 out of 257 applicants only 19 became apprentices; in 2018 just 20 out of 800 applicants made it through to the final stage of a formal interview.